Immigrated to America on July 3, 1967, Baltimore, MD. 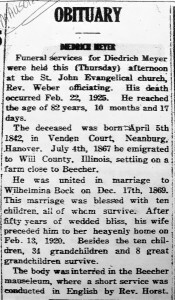 Husband of Wilhelmina (nee Block) Meyer, married December 17, 1869. Funeral services for Diedrich Meyer were held this (Thursday) afternoon at the St. John Evangelical Church, Rev. Weber officiating, His death occurred Feb. 22, 1925. He reached the age of 82 years, 10 months and 17 days. 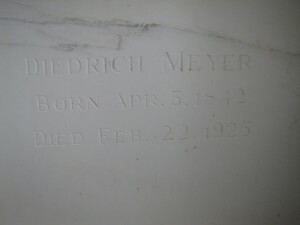 The deceased was born April 5th 1842, in Venden Court, Nienburg, Hanover, Germany. 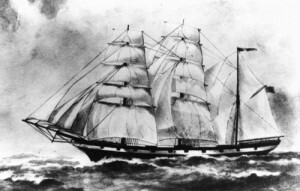 July 4th 1867 he emigrated to Will County, Illinois, settling on a farm close to Beecher. He was unit-ed in marriage to Wilhelmina Bock on December 17th, 1869. This marriage was blessed with ten children, all of whom survive. After fifty years of wedded bliss, his wife preceded him to her heavenly home on Feb. 13, 1920. Beside the ten children, 34 grandchildren and 8 great grandchildren survive. The body was interred in the Beecher Mausoleum, where a short service was conducted in English by Rev. Horst. This entry was posted in Automated Burial Listing, Burial Listing, Burial Location, HEADSTONE, Obituary very limited, St. John UCC, South Beecher by Sandra. Bookmark the permalink.